This door comes with vines, leaves, pops of orange daisy flowers and Ladybirds... Each spot on the Ladybirds backs attached to door, are hand rolled and placed, to make each door individual and magical... these little Ladybirds give your Fairy a little pet to play with. This door can be placed anywhere inside or outside. Attach it to a tree trunk or against your home to give the allusion of a special magical entrance. The door is weathered protected but recommend to use in under cover areas. 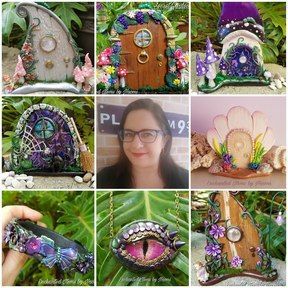 Can also be placed indoors on a shelf, a base of a wall, above the light switch... anywhere you would like to lure the Fairies to visit. Just place Blue Tac or a 3m wall strip to attach the door. Please note... no freestanding mushrooms or extra Ladybirds come with this door, only the Ladybirds that are attached ro the door...but can order them as an extra.